HE has the right sound bites, that’s for sure. 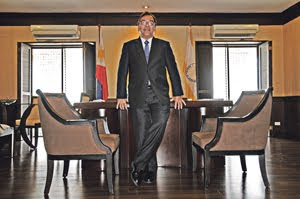 That’s what I first thought when advertising stalwart Ramon R. Jimenez Jr. faced his first press briefing as acting secretary of the Department of Tourism. He told the Malacañang press corps that promoting the Philippines’s beautiful sights should be “as easy to sell as Chickenjoy.” That comment shouldn’t be surprising—after all, Jimenez did handle the Jollibee account for years. A Visual Communication graduate of the UP College of Fine Arts, the advertising veteran is the co-founder—with his wife, the former Annabelle “Abby” Lee—of the Jimenez firm Winning Over Obstacles (WOO) Communications Corp. WOO was the marketing communications agency which helped focus the theme of then presidential aspirant Noynoy Aquino’s campaign on the “Daang matuwid, laban sa daang baluktot!” Previous to WOO, both also co-founded what was once the leading advertising agency Jimenez Basic. Don’t blame me. At the time I heard him say that, I had just come from Saigon, and was still marveling at the way the Vietnamese had packaged their country to tourists. Sure there were some issues with pickpockets (I walked through the Ben Thanh market with a firm grip on my bag), dishonest taxi drivers, and public smoking—but it attracted 5.05 million international tourists in 2010! The Philippines, on the other hand, managed to record only 3.52 million arrivals last year—and we’ve been at this tourism promotion thing since the Marcos administration in the 1970s. Then I heard Jimenez say in one of his many TV appearances that Thailand, Vietnam and Malaysia were already “very worried about what we’re about to do. They know we haven’t got the budget…. [but] Filipinos have always beaten them with less.” I almost fell off my seat. Those countries with bazillions in their tourism budgets, worried? Was this guy for real? When I finally met Jimenez at the ungodly hour of 9 a.m. (he apparently starts work very early, as his own advertising colleagues attest), he clarified a number of issues for me. Yes, he was “super optimistic,” as one media colleague described him to me, but he does actually believe what he is saying. He wasn’t being disingenuous. I now agree with my colleague that, that is probably just what the sector needs. That doesn’t mean Jimenez has his head way up in the clouds. On the contrary, he is quite aware that there could be a number of issues that may confound the implementation of the programs he wants to undertake. One thing he really needs to do, however, is manage the high expectations of the public. For instance, there already seems to be some issue with the much-anticipated tourism slogan. After Jimenez had announced to all and sundry that there were already seven advertising firms working on it, boasting even that “it’s a who’s who of everyone in the advertising industry,” it turns out, most of the bidders had already withdrawn their participation in the project. The DOT only recently announced it has decided to rebid the project with a lower budget, and revised terms of reference. (See “DOT rebids brand campaign,” BusinessMirror, October 3, 2011.) As of Oct. 15, 2011, the agency had yet to announce the list of shortlisted bidders for the brand campaign as per in its Bid Bulletin #3, which moved the announcement schedule from the original date of Oct. 12. What are we looking at in terms of tourist arrivals in 2012? We will break 4 million in 2012, that’s our objective. And if we do that, we will be ahead of schedule. We will hopefully exceed doubling the target by 2016 (or 6 million arrivals). But what is the DOT’s budget next year? Will it allow you to meet that 4-million target? Well, the DOT itself has less than P2 billion in its budget for everything. But the details are not important. There is a resource we cannot easily quantify, the support of Filipinos everywhere. We are far and away the most savvy Internet communicators in this part of the world. Let’s assume we finally found the so-called magic slogan everyone’s been waiting for, which is so unfair; no one ever had to clear a slogan with the country before because of what happened (in the past). But the vision is, once we have that, we put together what I call a tourism/country kit that anyone and everyone can pick up and transform into his or her microtourism campaign, whether they do it on Facebook, etc. We’ll give you the pictures, the slogans, the words, the basic tools you will need to create your own campaign. And theoretically, if every Facebook account holder can invite just one friend to visit, we would be the largest tourist country in Asia. In your first day as Tourism secretary, you already met with the controversial Tourism Congress representatives. May I ask what you talked about? The revised implementing rules and regulations (IRR) of the Tourism Act of 2009, especially those establishing a truly representative Tourism Congress, had been signed already by your predecessor. How are you going to implement these? Were there assurances made to the current representatives that they could stay? There has been no such discussion. The fact of the matter is, the current congress, their terms expire in November. Now, I am not inclined to wait for that. What I’m more inclined is to get the parties together before that time, because there is a very unique opportunity for all of them to participate in a genuine transition as dictated by the new IRR. Now, the existence of the IRR tells all the stakeholders that “Hey, this will be done as the IRR says. We can decide now—will it be neat or will it be messy?” That’s the way we Filipinos should begin to talk to each other. “Pwedeng graceful ’to, pwedeng hindi. But in effect, it’s going to happen.” The negotiations will end, and (I will) implement the law. How are you going to deal with the issue of Mark Lapid, general manager of the Tourism Infrastructure and Enterprise Zone Authority (Tieza)? The critical power of Tieza, contrary to popular belief, does not belong to the GM. It resides in a board that he reports to. Is he working under those limitations? Absolutely. He knows that. Frankly, in a way, I sympathize with his position. It’s a very short leash. So what happens to the Commission on Audit (COA) report? It’s like it never happened? The COA report stands as it is. First, I have to explain ’no, the problems are administrative; we’re not talking here of somebody stealing money, and that’s why, in fact, he was sanctioned. Certain movements have been restricted already. By and large, it’s very difficult to be him right now, okay? It’s not as if that COA report had no effect. But it is just that, it’s a report. It’s not a body of evidence or anything like that. That will continue to be lawyers’ problem. So there’s no actual stealing? No inappropriate use of funds? No. Only the Tieza board decides on these things. We’re talking about things he did with his staff, ’yung ganyan. So, why is COA talking about those things? It’s not fund misuse naman pala? To be fair to COA, people may have picked up on it, well-meaning I’m sure. That’s okay. It’s just as well, he knows, ah, be careful. Kasi I will certainly not stand for it. But my responsibility precisely is to make him productive. As per the new IRR of the Tourism Act, there are changes in store for the Tourism Congress and other tourism-related agencies, right? A new election has to happen? Yes. We can’t move forward on the Tourism Promotions Board (TPB) unless the Tourism Congress has now actively participated in nominating two people (to the TPB’s board). That includes the Tieza—may mga vacancies pa. So your first priority, of course, is the tourism slogan. What else is on your plate in terms of priority programs or projects? In terms of marketing and promotions, the priority is to transform the selling units, meaning, the smallest unit being the Filipino as individual, and the largest sets—the promotions units here, abroad and in the regions. Transformation means we’re giving them the tools, we’re making it clear what is the desired, or the cumulative net image we want to create, making it very clear in peoples’ minds, and conditioning them to accept that repetition is only a problem if you keep listening to your own propaganda. But do not tire of repeating your message over and over. That’s how it works. Ang tendency kasi ng Pilipino, they start embellishing because they tire of their own message. And they begin to lose the focus. It always happens—jeepney mentality—we never know when the work is finished. So we keep adding and adding until it is unrecognizable. The discipline is: “Here’s the country image, here’s what you say, and you repeat it, and repeat it, and repeat it, until we can reap the results.” So it’s a kind of reorientation and retraining of everybody. Now the other role, which is going to be played largely by me, Tieza, will be to reorient the rest of government toward, in effect, a more touristic economic plan…. Right now, tourism accounts for less than 6 percent of GDP (gross domestic product). It’s about 40 percent in Spain. It’s serious business. So what are your fighting targets for 2016? I’m not prepared to call it a target as much as, if you will, a sensible prediction. If this country breaks 12 million visitors by the end of the President’s term, then we would have successfully transformed it into a fourth of the nation’s business, and that’s the one that will fuel our future. It’s really worth fighting for. If we’re at 3 million, just trebling that should not be a problem. I keep saying, we’ve got a better product…we just have to keep improving it. That’s where the economic cluster comes in. I should say, they’re very, very receptive—(Secretaries) Greg Domingo (Trade and Industry), Mar Roxas (Transportation and Communications), Babes Singson (Public Works and Highways)—they’re all very willing to help because they know it can be done. Singson is really super supportive…. Correct. But like I said, that’s not as important as people genuinely trying to sell (the country) because 4 million come in with the present infrastructure, why do you think it is? But that’s why it’s important. You can get more tourists with better infrastructure. Absolutely, absolutely. [But] it’s a chicken and egg situation. I would rather much create the demand than force the issue on infrastructure, than rather force investors to put the money upfront, then the people didn’t come. That would be horrific! For example, investors in hotels, you think these people go around the world building hotels before the demand? No way! They’ve got to see at least the glimmerings of a 12-million visitor future for them to start digging now. As a third (priority, I want to) shore up all our other offices. There is the Philippine Retirement Authority, the Intramuros Administration, we have the Philippine Scuba Commission, Duty Free Philippines—it is the fourth-largest Duty Free in the world! If you look at their sales, they’re staggering, because of the OFW market. Sales were supposed to be down in September but they’re having a really good year. In fact, we’re lined up for an award in France, the Frontier Awards which is like the Oscars of travel retail. Can you break it down into more concrete projects? For instance, what are you going to do to clean up Manila? The plans for development of Luneta, Intramuros…all of that will take place within the next five years. Theoretically, money is not a problem. The money will be raised. There are many groups who are willing to invest, it’s just a matter of gathering the resources, getting the plans finally approved. But this whole area will be transformed. If we can do it faster than that, we will. That’s the easy part. The hard part, of course, is really rebuilding a lot of these things—the Chinese park, the Japanese park—we have to rebuild a lot of those. I was just talking to a GM of a hotel here in Manila. He was saying his and the other hotels along Roxas Boulevard are all in good locations, you have the Manila Bay sunset, etc. But it’s so dirty here! Then you have the social issues tourists are confronted with—a lot of beggars, thieves, etc. And you can’t even ask them to go around taking the MRT or LRT; you go to Beijing, the subways are interconnected and clean…. But said another way, in Beijing the tourist areas are neatly isolated from the rest of the areas. There are some icky places, but they were able to create some islands of calm…we will be able to do that. Theoretically, if somebody arrives in the Philippines, and went to Makati then straight to Bohol, they would probably think…. Wow, the Philippines is so beautiful! Yeah. I have met people from India who couldn’t believe Makati. Something as lush as this couldn’t be found in India. When we rebuild our country, including the not-so-pretty places, it’s going to take time. Now our point of view is the Luneta, the Intramuros…if you did it correctly, you could shuttle people directly from Intramuros to the Luneta areas and Roxas Boulevard without ever having to see those. Right now, we just don’t have those linkages. ’Yun lang ’yun. Right now, it’s like getting people through New York having to pass by the Bowery every time because the infrastructure was made that way. Therefore the conclusion is, “Oh Manila is an ugly city,” because we make them pass there eh. We will create that flow. So what is your vision for Intramuros? Two things. Rebuilding it with stone is one-half of the restoration. The other half, is bringing back its spirit, its openness to new ideas, the arts, culture, music, etc. This is the venue for that. This will spell the rebirth of Intramuros after its physical restoration…. We’re already lining up artistic activities both in the performing arts and in the fine arts for next year. Intramuros will rise again. The plans are already very detailed. But this will be the subject of PPP (public-private partnership) projects, because it is, in fact, a mini-city. The complications are, many people don’t know that not all the property in Intramuros is not public land. There are private parcels and it will require relocating informal settlers, etc. During Secretary Lim’s time, he tried to talk to the Department of Finance about removing/eliminating the common carriers’ tax imposed on foreign carriers, but Secretary Purisima thumbed it down. Are you going to pursue the issue? We would be the advocates of less fewer restrictions. So wherever I see an opening, I’m gonna squeeze in there. You can expect, every time we encounter such a barrier and we feel it is in our country’s interest touristically to take down that barrier, we will take it up (with the agency concerned). How are you going to professionalize tourist guides who are keys in enhancing the whole tourism experience? This is in early days…my simple attitude; it will demand more involvement form the academe, more from the youth, that’s the only way. There would be more involvement from citizens who are natural historians—teachers, professors—but we have to put together a program that makes it worth their while. I was telling them (DOT officials), you have the laboratory right here. The national standard for comfort rooms, we can build here (at the Rizal Park). The national prototype for tour guides, we can set them up right here. We’re not using these facilities as a national laboratory that we need, so that LGUs can see how it’s done. I intend to change that.